Texas Palliative Center provides only the highest standard of care, comfort and quality of life for patients and family members dealing with serious, advanced illnesses, which may or may not be terminal. When they asked Stanton Street to create their website, it had to meet the highest standards as well. 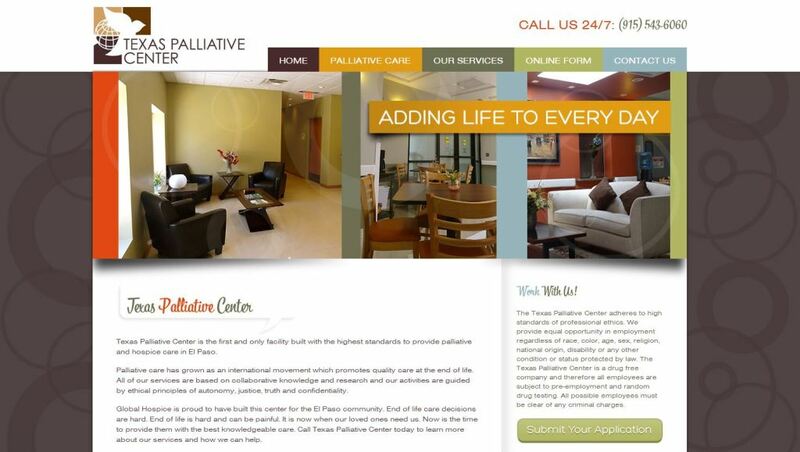 Warm, welcoming and compassionate to all whom enter the doors of Texas Palliative Center, we knew the website had to portray the very same look and feel while imparting valuable information about such important services. The website explains that palliative care, supportive care, end of life care and hospice care are terms that are frequently used interchangeably. Although hospice care and end of life care are different from the others and always a part of palliative care. The Services page goes into greater depth about the range of palliative medicine and its philosophy that is the cornerstone of this amazing facility. The website also includes a simple to use online employment application form if you are interested in joining the dedicated staff of the Texas Palliative Center. Stanton Street wanted to make sure that management of the Texas Palliative Center’s new website was easy. This was made possible with a content management system, where website copy and online forms are simply and quickly managed. Do you need a website custom made to express your style, needs and high standards? Stanton Street is happy to give you the same TLC we extended to Texas Palliative Care. Give us a call or send us an email. We are here for you! This is such a nice piece of information. I am glad that I came across this blog and this blog helped me to understand that websites can be that helpful. Thanks for your input! We believe every website should serve a purpose for the business and their customers. Let me know if you have any questions or topics that you would like for us to cover and we’ll add to our list for future posts.